[Re:]Entanglements seeks to research and rearticulate the collections originally assembled by the anthropologist N. W. Thomas in the early years of the twentieth century in Nigeria and Sierra Leone. What does this remarkable ethnographic archive mean for different people today? In the early twentieth century, anthropological fieldwork was primarily directed toward collecting and documentation. In the course of four anthropological surveys in West Africa, Northcote W. Thomas assembled remarkable collections of artefacts and local arts and crafts, but also ‘specimens’ of language, and even botanical species. With the aid of local assistants, he documented many aspects of contemporary life in Southern Nigeria and Sierra Leone in thousands of photographs; recorded songs, stories and music on wax phonograph cylinders; and conducted household surveys. Thomas’s fourth tour, in Sierra Leone, coincided with the outbreak of the First World War. Due, in part, to the straitened economic conditions that prevailed, it was decided to discontinue this early experiment in colonial anthropology. Rather than being kept together, Thomas’s collections were dispersed to various institutions where they were mainly put into storage. For the first time in over 100 years, as part of the [Re:]entanglements project, we shall be researching and rearticulating these collections, which today constitute a unique ethnographic archive of life in areas of Nigeria and Sierra Leone in the early 1900s. We are interested in understanding what this archive means to different people today. As the work of reassembling these collections proceeds, we’ll be posting our discoveries and our queries to the project blog. We welcome your help. If you have any insights into the objects, photographs, sound recordings and other materials we post about, please do add your comments or get in touch using the contact form. Thomas was particularly interested in material culture. He photographed many objects in situ, and documented manufacturing processes such as pot-making. He also collected around 3,000 objects, the majority of which were subsequently acquired by the University of Cambridge Museum of Archaeology and Ethnology (now the Museum of Archaeology and Anthropology). From the little correspondence that survives relating to his collecting practices, it appears that Thomas purchased and commissioned the majority of objects he collected. He occasionally photographed his collections prior to sending them to the UK. Igbo maiden spirit mask collected by N. W. Thomas, probably from Awgulu in 1911. 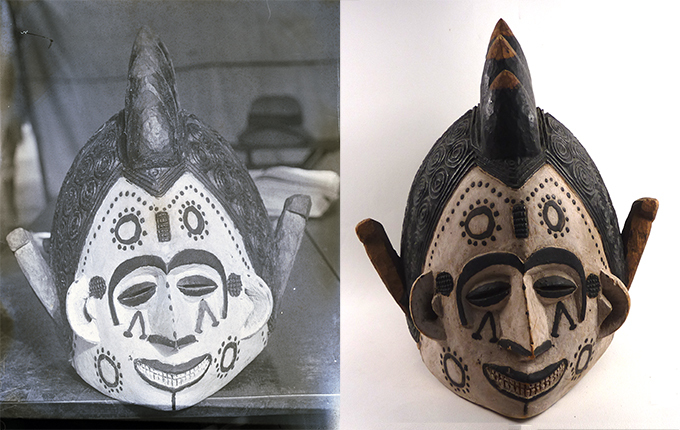 On the left is Thomas’s field photograph of the mask, on the right, the mask today in the collection of the University of Cambridge Museum of Archaeology and Anthropology, Z 13690. In 2012-13, Dr Ohioma Pogoson of the Institute of African Studies at the University of Ibadan conducted pilot research on N. W. Thomas’s collections from North Edo while a Visiting Fellow at the Museum of Archaeology and Anthropology. Information on a selection of objects from North Edo can be found on the Museum’s N. W. Thomas Project website. In addition to the extensive collections at Cambridge, a small number of objects from N. W. Thomas’s first tour are held by the Pitt Rivers Museum, Oxford. Over the 55 months between 1909 and 1915 that Thomas spent conducting fieldwork in Nigeria and Sierra Leone, he exposed approximately 7,000 quarter plate glass negatives. Around 5,200 of these negatives survive and are held in the photographic archives of the Royal Anthropological Institute. Approximately 6,200 loose contemporary prints are held by the University of Cambridge Museum of Archaeology and Anthropology. About half of the photographs that Thomas took during his three Nigerian tours were compiled in triplicate sets of albums, each set comprising eight volumes. Originally, sets of these albums were held by the Colonial Office in London and the Colonial Secretariat in Lagos, while a third set was intended for scholarly reference and held by the Horniman Museum in South London. Today copies of the albums are held by the UK National Archives and the University of Cambridge Museum of Archaeology and Anthropology. At least one of the albums is now held by the National Museum, Lagos and we are trying to ascertain whether others have also survived in Nigeria. 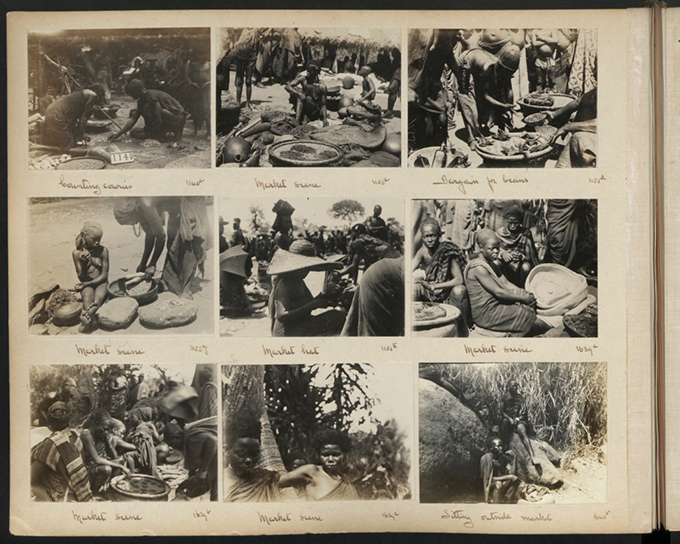 A page from one of the photograph albums from N. W. Thomas’s first tour, among Edo-speaking communities in Southern Nigeria. The photographs were arranged under approximately 30 thematic headings. This is one of three pages devoted to ‘markets’. One of the most remarkable legacies of N. W. Thomas’s anthropological surveys are the field recordings he made. These were recorded on wax phonograph cylinders without the use of a microphone. Thomas made over 700 recordings, including samples of speech in the different regional dialects used in the areas in which he worked, as well as songs, stories and musical instruments. Copies of the wax cylinders were originally deposited at the Museum of Archaeology and Anthropology in Cambridge, the Pitt Rivers Museum in Oxford, and the Horniman Museum in South London for scholarly reference. The British Library Sound Archive now holds the most complete set. Hausa ‘small boy’s song’ recorded by N. W. Thomas in 1909 during his first tour as Government Anthropologist. NWT117a. BL C51/2408. Thomas also transcribed and translated a selection of the recordings using a somewhat idiosyncratic phonetic alphabet. Here is an example of an Igbo story he recorded in the Asaba region, ‘The Tortoise and the King’. 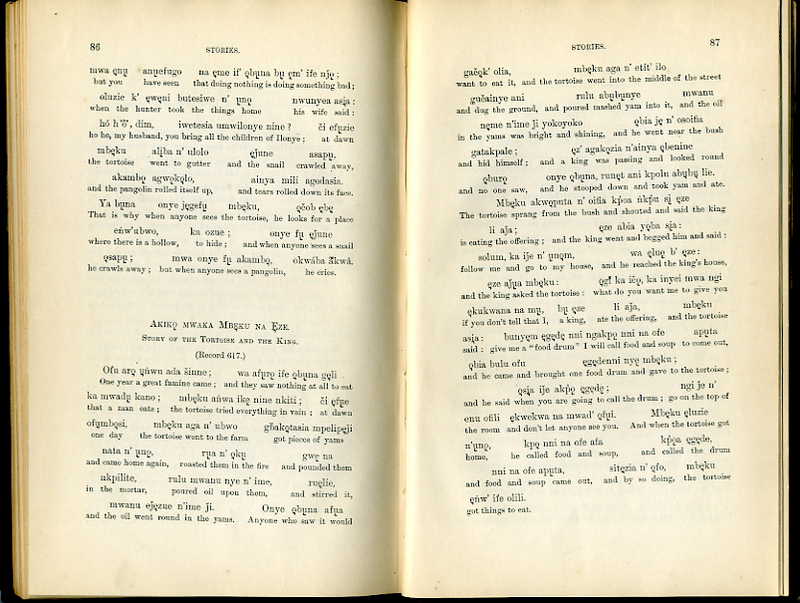 Transcript of the story of ‘The Tortoise and the King’, published in N. W. Thomas, Anthropological Report on the Ibo-Speaking Peoples of Nigeria, Part VI, Proverbs, Stories, Tones in Ibo, London 1914. Igbo story of ‘The Tortoise and the King’ recorded by N. W. Thomas in the Asaba region in 1913. NWT617. BL C51/2942. Explore Northcote Thomas’s sound recordings at the [Re:]Entanglements project SoundCloud. Thomas became increasingly interested in ethnobotany and, from his second tour, made large collections of botanical specimens for the Herbarium at the Royal Botanic Gardens, Kew. Thomas recorded the vernacular name of plants in the local language and made notes on their use. To this day this constitutes an important reference collection of botanical species in Southern Nigeria and Sierra Leone. The dates and localities Thomas noted on the specimen cards provide the most comprehensive record of his tour itineraries. 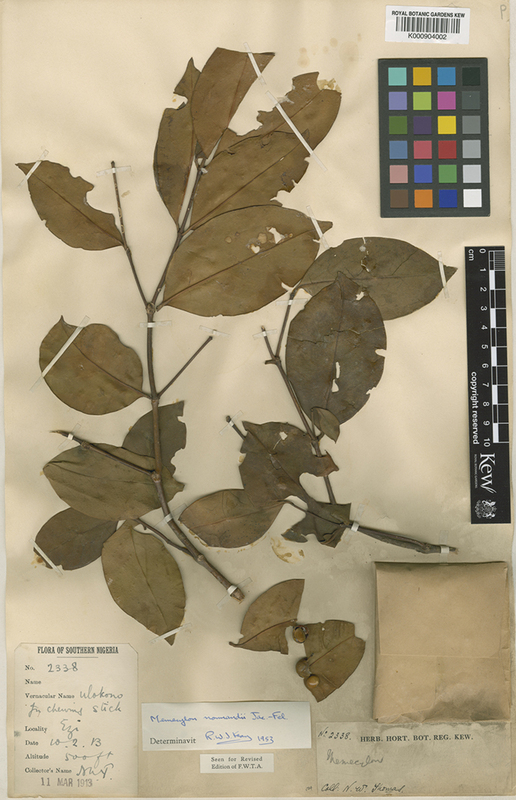 Specimen of Memecylon normandii collected by N. W. Thomas near Ezi during his third tour, in the Asaba region, in 1913. Royal Botanic Gardens, Kew K000904002.